As advanced and solid as the E46 feels it has a major weakness in the rear suspension: the subframe rips away from the chassis. The subframe is bolted to the chassis at four points under the trunk floor. The attachment points where it gets bolted are spot welded to the sheet metal of the floor. As the rear differential transmits the torsional load from the engine through the subframe, then into the chassis, the sheet metal flexes and twists and will break the welds with additional cracks forming through the sheet metal. Worn rubber subframe mounts add fuel to the fire and promote further twisting. 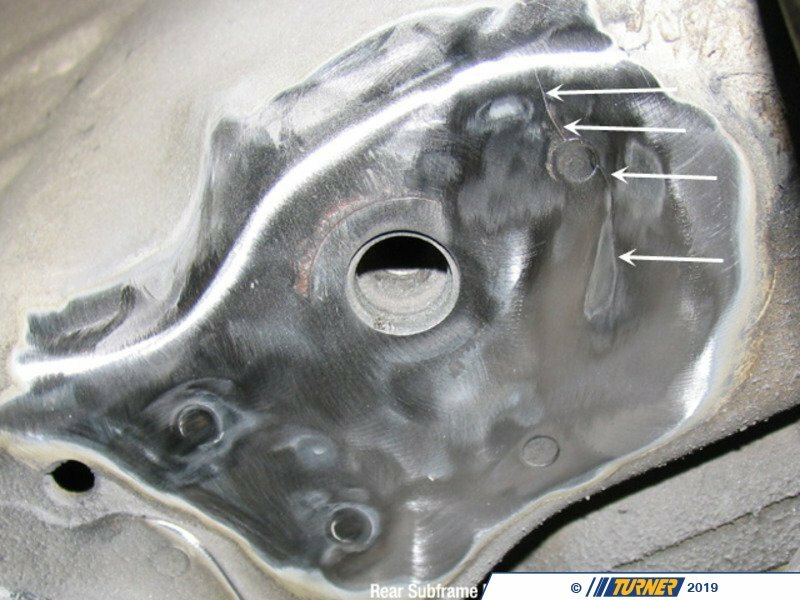 This constant loading and unloading weakens the sheet metal and causes it to fatigue and separate from the chassis (see images below). 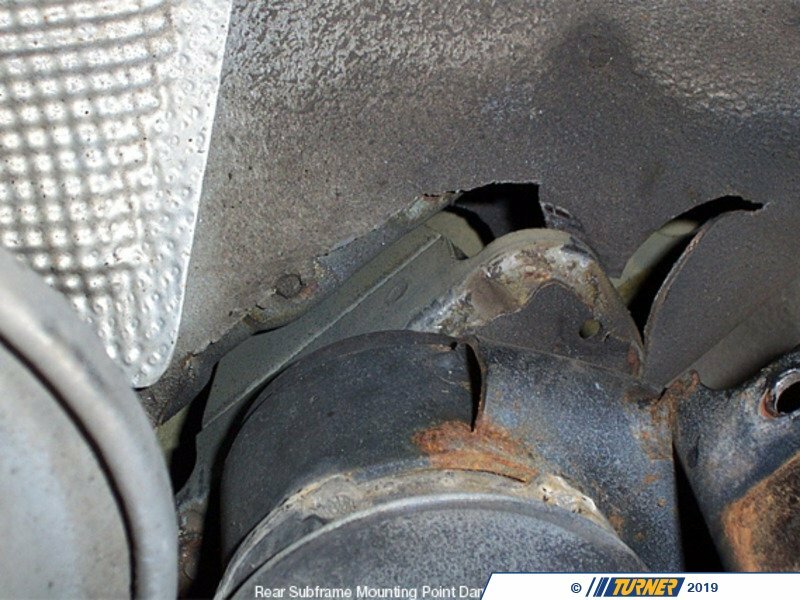 The issue is widespread on all 1999-2006 E46 sedan and coupe models (we have not seen any E46 convertibles with this issue). A very similar issue preexisted on the E36 models and BMW fixed it by welding reinforcment plates on the floor. BMW tried to fix the issue during the design of the E46 by placing a cross member on the front two mounting points of the subframe. This cross member keeps the front mounting points from having problems by placing the bushing and the stud in double-sheer, thus reducing the twisting action on the sheet metal. The unfortunate side effect of this is that the load from the front of the subframe now gets transmitted to the left rear of the subframe. This is where we have seen many failures of the chassis on low mileage street cars and race cars. 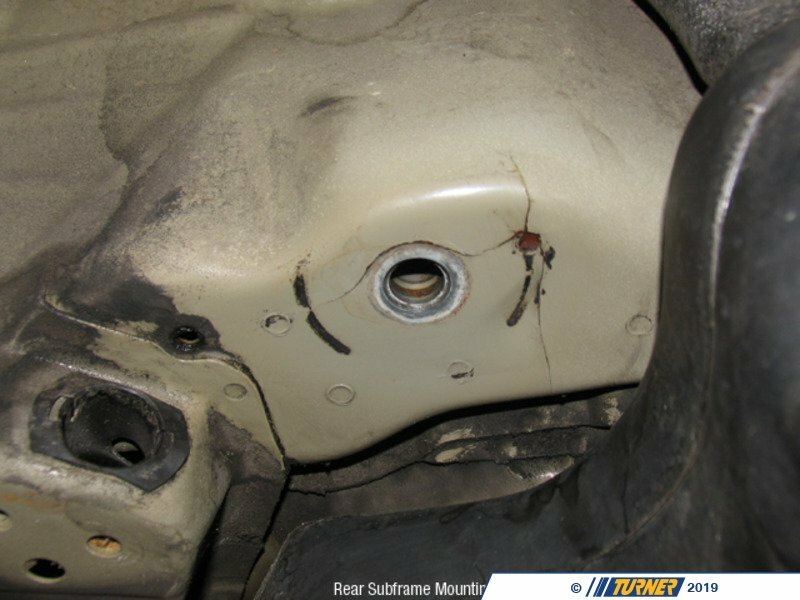 Our Turner E46 rear subframe reinforcement kit thickens the sheetmetal over a greater area. This spreads the load over a wider and stronger area than before. We also include instructions and new sheetmetal for reinforcing the top of the subframe mounts in the trunk floor, an often neglected location that also fails. This kit will save time when repairing the chassis, and is also strongly recommended as a preventative maintenance item. Click here for more information on this kit. 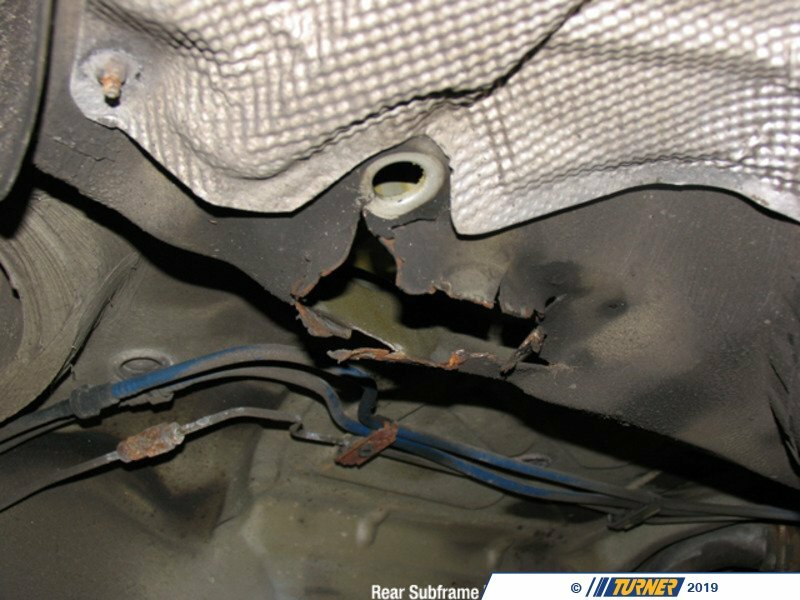 Below are photos of subframe damage we have repaired in house.